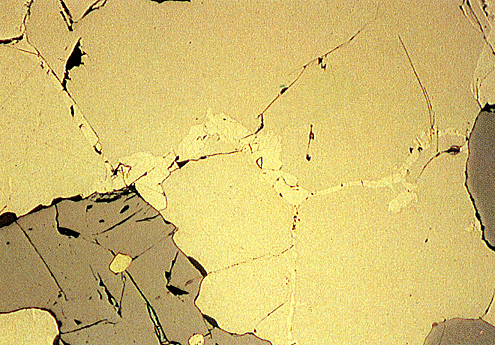 Pyrrhotite crystals (light brown) have granular pentlandite crystals (light brown, higher reflectance, centre left) along their grain boundaries but are free of flame-like exsolution bodies of pentlandite. Magnetite (grey, bottom left) encloses a crystal of chalcopyrite (yellow, bottom left). Black areas are polishing pits.